This is a picture from last week (Valentine’s Day!). Some pronouns changed in our relationship since August, but the fire still burns hotly. You may have heard of StoryCorps. They’ve been recording stories across America since 2003, archiving more than 50,000 of them in a little more than a decade. A few of their recordings get edited down professionally and published on NPR, and you’ve probably heard one of them at one point, or another (they’re online!). The rest of the time, they archive the digital recording at the Library of Congress, in their American Folklife Center. One cool thing about StoryCorps is that they try to oversample underrepresented stories. Last summer, they came to Grand Rapids, and they worked with OutPro, The Network, and others to help collect more LGBT voices. We recorded with them on August 16, 2014. This was kind of amazing timing, because just around that time, the Smithsonian’s LGBT collection plans were unveiled, and there has been talk about possibly creating duplicates of LGBT narratives, like ours, and also putting them in that collection, which is something that’s happened with StoryCorps recordings in other target areas. 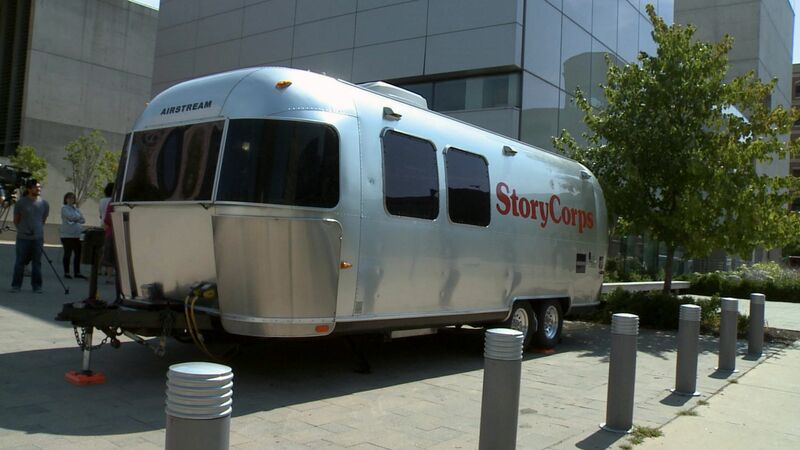 This is the actual StoryCorps trailer, it has a mad fierce sound booth tucked away in it, and you can actually get a great audio recording even while there’s a festival going on in Rosa Parks Circle right outside the door. Technically, you can go listen to our story at the Library of Congress. Unfortunately, right now, the unedited stories do not go online. However, the StoryCorps people provide a CD of the recording and permission to excerpt and publish that. I’ll have to admit it took me all the way until January to finally rip the CD onto my Macbook Pro and start editing it down in Audacity, and I just finally figured out how to do some channel mixing and compression on it, get it to a manageable size (the interview is 45 minutes long; this excerpt is only 10), and upload it somewhere so I can stream it from this blog. The excerpt here focuses on the story of how Teri and I met (I know, sickeningly sweet) and fell in love, and how we find that our relationship allows us to strengthen each other in our passions for serving children, me with my roles at the Center for Autism and with the AACRC, and Teri as a facilitator of our LGBT Youth Group at The Network. In picking 10 minutes to share, I was challenged with what to admit. Somewhat to my surprise, I didn’t keep the parts about LGBT advocacy, really, even though this is a huge part of our lives. I did save one part, where Teri came out to me, for the first time*, in words, about being trans himself, since back at that time, we were publicly lesbian identified (and not yet heteroqueer). I cut out a lot of me talking about my little autism kids, because, well, we have other videos on that topic (and once you get me started, I scarcely have the ability to stop). I really decided to focus on our love story. Why? Because it’s my favorite part of the interview. Because it’s the story that just gets better (and perhaps slightly more exaggerated) every time we’ve told it**. 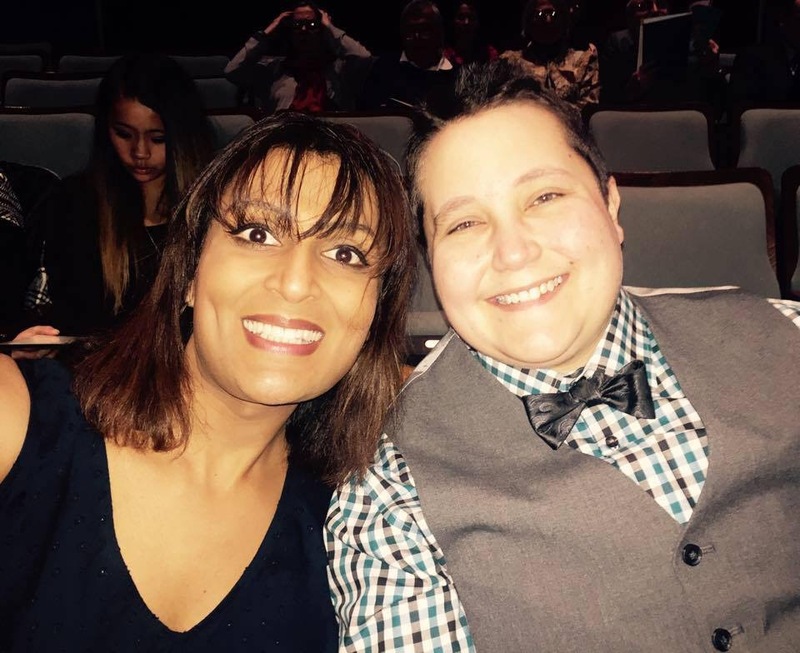 I suppose that opens me up to criticism of bleaching away the queerness of our story, but in my defense, I think it is important to remind the world that even we, two trans people in a loosely heterosexual relationship – even we have love stories just like anyone else’s. So, it isn’t me preaching feminism. It isn’t me talking about the amazing future we have, when NT’s and NNST’s start building the world, hand in hand. It isn’t about the message of a day when we are equal in our lives, our loves, and our gifts. It’s just a love story. Hate it if you may, dear reader, but in hating love stories, must you not also find yourself hating love? And without love, what are we? * Yes, in the sound booth, girlfriend. It was not, however, the biggest shock in the world. ** I know, we tell it a lot. It’s become kind of legendary among my close friends.